The Museum exhibits various artifacts discovered during excavations of an area called "Khuan Luk Pat" or a bead mound behind Wat Khlong Thom. Unearthed artifacts include stone tools, bronze implements, metal coins, pottery shards, ceramic and stone decorative art and colored beads that are over 5,000 years old. 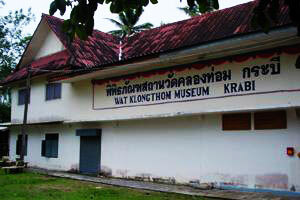 This Museum is situated within the compound of Wat Khlong Thom between Kilometer marker 69-70 on Phetchakasem Highway, one kilometer from the District office.